Longhorn Cavern State Park is 645.62 acres of rugged Hill Country south of Burnet in Burnet County. 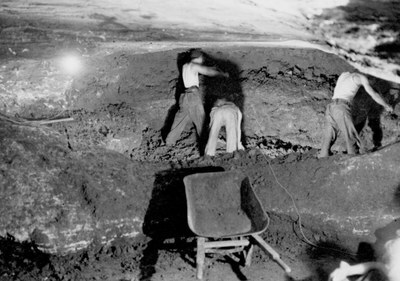 The state acquired Longhorn Cavern from private owners in 1932 to 1937. The park opened in 1938, and was designated a National Natural Landmark in 1971. Over the last million years, water left a thick layer of mud and debris in the cave. As a result, early visitors could only use a small area of the cavern. The cave has provided shelter since prehistoric times. Some of the earliest visitors were the area’s prehistoric peoples. They used the large room next to the main entrance for shelter. 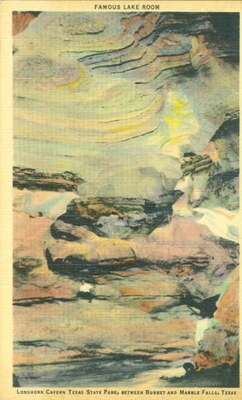 Anglo settlers discovered the cavern in the mid-1800s. They mined bat guano, used to manufacture gunpowder during the Civil War. Many legends and stories surround the cave. According to one, the outlaw Sam Bass hid a $2 million cache of stolen money inside. Of course, there’s no evidence that Sam Bass ever visited the cave. Another legend says Texas Rangers rescued a kidnapped girl from Indians in the cave. Confederates made gunpowder in the cave during the Civil War. Stories like these drew tourists as early as the turn of the 20th century. By the 1920s, the main room served as a dance hall and concert venue. From 1934 to 1938, the Civilian Conservation Corps built many of the structures in the park.